Sizing 50 sq. 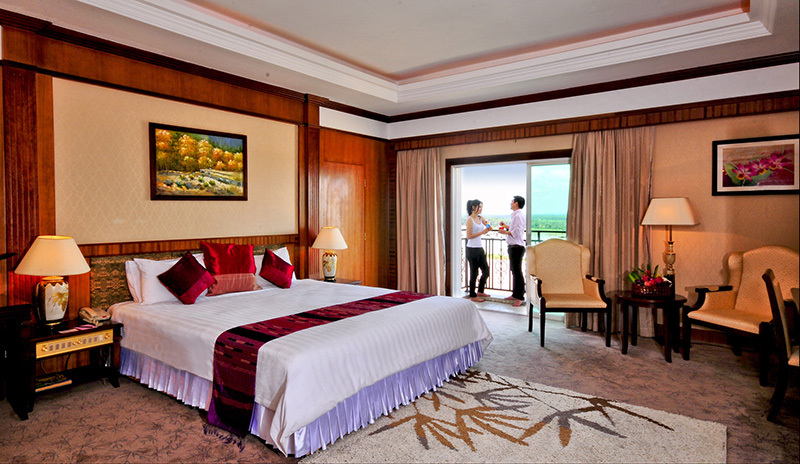 meters, each of our deluxe room with high ceiling boasts a king size bed and a private and personal balcony over-looking the majestic Mekong River and sunset. Each room is equipped with a jacuzzi complete with luxurious amenities, individually controlled centralized air-conditioning, IDD Calls with bathroom extensions and voice mail, in-room electronic safe, mini bar with coffee/tea making facilities, computer ports and high speed internet access for a comfortable and relaxing stay. Decor - These rooms are elegantly decorated in warm, muted tones, with plush linens and exotic Lao wood. Bathrooms are equipped with bathtub.